Google Chrome is a nice web browser and it even becomes better with extensions. There lots of Chrome extensions to help you in different tasks and improve productivity. There are few Google Chrome extensions that even helps you in keeping yourself safe while browsing the web. 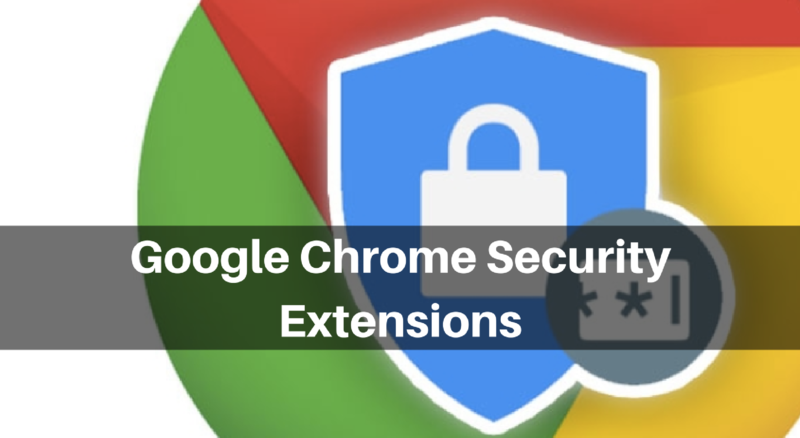 In this article, I am listing few best Google Chrome extensions to keep your safe. These Chrome Security Extensions are available for free from Chrome web store. These are the 11 best Google Chrome security extensions. You can also consider these as must-have security extensions for Chrome to keep your web browsing safe. Avast Online Security aims to keep your web browsing safe from various Internet threats. It detects phishing pages and scam website and warns you immediately. It also autocorrects mistakes in the URL to ensure you do not end up visiting any fake website with misspelled domain. This chrome extension also blocks the tracking cookies to keep your browsing private. It also shows if a website safe to browse on Google search. SO, you can easily avoid fake or scam websites. Avast Online Security comes with an options panel that allows you to configure different things. Password Alert is a nice Chrome extension by Google. it aims to protect against a phishing attack. If you enter Google Account password on any page other than Google’s sign in page, it will show an alert and suggest you change your password. This is the one of the most important Chrome security extensions you should not ignore. HTTPS ensures an end to end data encryption from your browser to server. So, the third person cannot monitor your activity or steal data. Unfortunately, not all websites support HTTPS. But, you can still keep your connection secure by using HTTPS Everywhere. HTTPS Everywhere is a nice Google Chrome extension that connects to an HTTPS version of websites if possible. It automatically switches thousands of sites from insecure “HTTP” to secure “HTTPS”. Secure Mail for Gmail is a nice tool for Gmail users. It lets Gmail users send encrypted emails to other users. In this way, your emails cannot read by anyone including Google. Developers of this extension also cannot read your emails because everything is done on the client site. The recipient will have to use the same password to decrypt the email that you used while encrypting the email. You can try this Chrome extension if you share sensitive information over email. Now days, VPN is an important thing we should start using. It helps in anonymizing online activity. If you are using Chrome, you can try DotVPN Chrome extension. It is free and offers unlimited bandwidth. You can select from to 12 locations for free. This chrome extension also allows you to open .onion websites. It also has built-in firewall to protect inbound connections. Note: Opera browser comes with built-in VPN. Read how to use Opera VPN. Ghostery is another nice Google Chrome extension to give you control over your privacy. It shows what trackers and gives you option to block or unblock trackers. The best thing is that it shows trackers in tracker categories such as advertisements, analytics etc. So, you can easily understand what a tracker may track and what trackers should you block. WOT is a known website that uses community rating system. Users add comments and rate websites. This services use that data to notify you if you are accessing any scammy website. In this way, you can easily avoid online scams. If there is no rating for a website and you have doubt on it, you cann ask for a review. VTchromizer is the security extension by popular VirusTotal. VirusTotal is an online service that analyzes suspicious files and URLs and notifies if there is a malware or any other kind of suspicious thing. After adding this extension, you will get ability to scan any link just by doing right click and selecting the appropriate option. LastPass is a popular service to manage your password. You only need to remember one password that is the master password of LastPass. It will autologin to your sites and sync your passwords everywhere you need them. So, you do not need to remember or note multiple passwords. All passwords are locally encrypted to keep your passwords safe from hackers. Credit Card Nanny highlights if a website stores or sends your credit card details as plain text. Saving or sending credit card details in plain text is harmful and any hacker can intercept data to know your details. Credit Card Nanny warns you and you can avoid typing your credit card details. Click&Clean is actually a cleaning tool that gives you one click option to clear all the traces of your online activity. It clears internet history, cookies, cache files, saved URLs, flash cookies, temporary files, web SQL databases, and more. This Chrome extension also comes with built-in anti-malware powered by popular security company BitDefender. This anti-malware scans your PC to detect malware. You can also find more Chrome extensions that offer similar kind of options. There are many good VPN extensions, antimalware extensions and more. But this list contains the best from all. Try these Chrome security extensions to keep your web browsing safe and avoid online threats. If you have anything to ask, you can always leave comments.